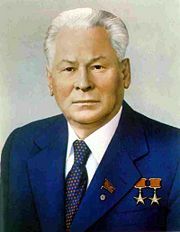 Konstantin Ustinovich Chernenko (Russian: Константи́н Усти́нович Черне́нко; September 24, 1911 – March 10, 1985) was a Soviet Union politician and General Secretary of the Communist Party of the Soviet Union and who led the Soviet Union from February 13, 1984 until his death just 13 months later. Chernenko was also Chairman of the Presidium of the Supreme Soviet from April 11, 1984, until his death. Chernenko, like his immediate predecessor, Yuri Andropov, held office for a very short period, and was the last of an old guard for whom communism was still the only ideology. Chernenko perpetuated the same policies that had dominated during the long leadership of Leonid Brezhnev, but the USSR could not continue to spend as much of its revenue on military might, or sustain its war in Afghanistan. His successor, Mikhail Gorbachev, would introduce reforms aimed initially to enable the survival of the communist system, but which eventually led to the Soviet Union's collapse. Chernenko was born in Bolshaya Tes, Novosyolovsky District, Novosyolovsky District, Krasnoyarsk Krai, Siberia. He joined Komsomol in 1926 and the Communist Party in 1931. After a brief stint in the Frontier Guard on the Sino-Soviet border, he became a career politician. The turning point in Chernenko’s career was his assignment in 1948 to head the Communist Party’s propaganda department in the Moldavian Soviet Socialist Republic. There he met and won the confidence of Leonid Brezhnev, the first secretary of Moldova from 1950-1952 and future leader of the Soviet Union. Chernenko followed Brezhnev in 1956 to fill a similar propaganda post in the CPSU Central Committee in Moscow. In 1960, after Brezhnev was named chairman of the Presidium of the Supreme Soviet (titular head of state of the Soviet Union), Chernenko became his chief of staff. 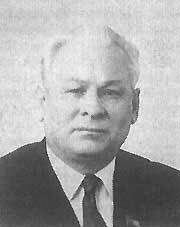 In 1965, Chernenko became Director of Personnel in the party's General Department. In his new powerful position, he had knowledge about the top people in the party and monitored wiretapping and surveillance devices in offices; however, his main job was to sign hundreds of documents every day. This he did for 20 years. Following the death of Brezhnev in 1982, Chernenko lost the power struggle to succeed him due to anti-Brezhnev forces, including the KGB and the Red Army, and instead Yuri Andropov, the former head of the KGB, was chosen General Secretary. When Andropov died in February 1984, after only 13 months in office, Chernenko was elected to replace him, despite concerns over his health, and against Andropov's stated wishes (he specifically wanted Mikhail Gorbachev to succeed him). Chernenko represented a return to the policies of the late Brezhnev era. Nevertheless, he supported a greater role for the labor unions, reform in education, and trimming of bureaucracy. In foreign policy, he negotiated a trade pact with the People's Republic of China. Despite calls for renewed détente, Chernenko did little to prevent the escalation of the Cold War with the United States. For example, in 1984, the USSR prevented a visit to West Germany by East German leader Erich Honecker. However, in the late autumn of 1984, the United States and the Soviet Union did agree to resume arms control talks in early 1985. Chernenko's poor health made him unable to govern effectively. His very frequent absences from office left little doubt that his reign had only been an interim measure in a longer struggle between conservatives and reformers. Chernenko had emphysema of the lungs and his aggravated lung and heart insufficiency worsened significantly in the last three weeks of February 1985. Another, accompanying illness developed—chronic hepatitis, or liver failure, with its transformation into cirrhosis. The cirrhosis of the liver and the worsening dystrophic changes in the organs and tissues led to a situation where the state of his health gradually deteriorated. On March 10 at 3:00 p.m. he fell into a coma, and four hours later died as a result of heart failure. He became the third Soviet leader to die in just two years time, and, upon being informed in the middle of the night of his death, United States President Ronald Reagan is reported to have remarked "how am I supposed to get anyplace with the Russians if they keep dying on me?" Chernenko was given a state funeral and buried in the Kremlin necropolis. Mikhail Gorbachev was quickly elected by the Politburo to succeed him. After the death of a Soviet leader, it was customary for his successor to open and review the objects contained in his personal safe. When Gorbachev had the safe opened, they found a small folder of personal papers and large bundles of money stuffed into the safe. Even more money was discovered in his desk. No one has ever discovered what he had intended to do with the money. Due to Chernenko's short time in office, very few photos exist of him. The majority of the photos that were taken are in black and white. Border Guard, Party Secretary of Border Guard Unit, Agitprop director in Krasnoyarsk and other regions, Party functionary (apparatchik), Central Committee member and secretary, Politburo member, Supreme Soviet Presidium member, Chairman of the Presidium of the Supreme Soviet, General Secretary of the CPSU. He had a son by his first wife (whom he divorced) who became a propagandist in Tomsk. His second wife, Anna Dmitrevna Lyubimova, bore him two daughters, Yelena (who worked at the Institute of Party History) and Vera (who worked at the Soviet Embassy in Washington, DC), and a son, Vladimir, who was a Goskino editorialist. This page was last modified on 9 February 2009, at 16:58.